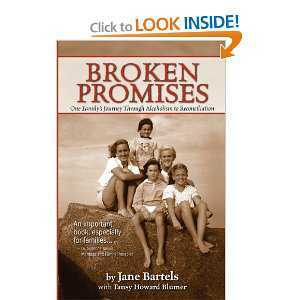 Hello guys, I just wanna share with you today a wonderful & inspiring book, BROKEN PROMISES by Jane Bartels. Lost in the pull of alcoholism, Jane Bartels did the unthinkable. She left her five young children in order to drink. This is not only the story of one person's descent into hell, it is also the story of a vulnerable young family of five children trying to stay strong while their mother continually disappoints and betrays them. While Jane tells her story with searing, heart-breaking honesty, the children provide their own gut-wrenching, emotional response. Their shared story provides a penetrating and unique view of the toll which substance abuse inflicts on entire families.